Who has access to DStv Now? DStv Now is a free download. A connect ID is required to access DStv Now. Your ability to view Live TV channels and Catchup will vary according to your subscription. Which devices can I use to watch DStv Now? You can access DStv Now online by visiting www.dstv.com/now. DStv Now apps are also available for certain Android devices (tablets, phones and Android TV device) and certain iOS devices (iPad and iPhone). Android devices must be Google-certified, and must be running Android version 4.4 (KitKat) or higher. You can check if your device is Google-certified by checking the Google Play Store settings. We use the Google SafetyNet API to ensure that devices are not rooted (including factory rooted) or have a tampered boot loader. SafetyNet also ensures that the Google Play Store is supported by default on a device and the device is not running a side loaded version. We do not support side loading the DStv Now app on devices, the app must be installed via the play store. iOS devices must be running iOS9 or higher. DStv Now used to work on my device, now it doesn’t. What has changed? DStv upgrades it’s security requirements from time-to-time to comply with rights agreements. This may impact devices that don’t comply with these changes. Where do I get the DStv Now App? If you have an iOS device (iPhone, iPad or iPod Touch), you can download the DStv Now app from the Apple App Store. If you have an Android device (tablet, smartphone or Android TV device), you can download the DStv Now app from the Google Play Store. How much will it cost me to use DStv Now? DStv Now is available at no extra charge. Making use of the app, streaming Live TV and watching DStv Catch Up content, however, does consume data, which may incur additional costs from your network operator. We strongly suggest using DStv Now in conjunction with an uncapped ISP account and familiarising yourself with the fees that your operator charges for data (both in and out of bundle). What do I need to start using DStv Now? You need to have access to a PC or MAC, or an Android or iOS device, plus access to a broadband Internet connection and you also need a Connect ID. We strongly suggest using DStv Now in conjunction with an uncapped ISP account and familiarising yourself with the fees that your operator charges for data (both in and out of bundle). Streaming Live TV and watching DStv Catch Up content is only available to active DStv Premium, DStv Compact Plus and DStv Compact customers. How do I use DStv Now? Login to DStv Now via your PC or MAC, or download the DStv Now App from your App store. You will be asked to Login using your Connect ID. If you don't have a Connect ID, please refer to the Connect Login and Registration. Link your smartcard to your DStv Connect Account Website users can do this by following the prompts on the website. iOS users who have downloaded the app need to visit www.dstv.com. Android users who have downloaded the app will be given the option to register and link smartcards within the App. Note: streaming Live TV and watching DStv Catch Up content is only available to active DStv Premium, DStv Compact Plus and DStv Compact customers. How much data will DStv Now use? As with any other video service, content streamed from DStv Now could potentially use large amounts of data. You are able to control the amount of data used by selecting the Video Quality setting while playing video on the DStv Now website, or changing the Maximum Video Quality in the Settings menu of both the Android and iOS apps. Standard Definition (SD) channel can consume between 1.9MB per minute and 13.5MB per minute. High Definition (HD) channels can consume up to 20MB per minute. We strongly suggest using DStv Now in conjunction with an uncapped ISP account and familiarizing yourself with the fees that your operator charges for data (both in and out of bundle). What Internet connection do I need in order to use DStv Now? You can use DStv Now on any broadband Internet connection, including ADSL, 3G/HSDPA, 4G/LTE or Wi-Fi. A minimum connection speed of 2Mbps is required, but for the best experience, we recommend a 4Mbps line or faster. It is highly recommended that you use DStv Now in conjunction with an uncapped Internet account to avoid unexpected data bills. 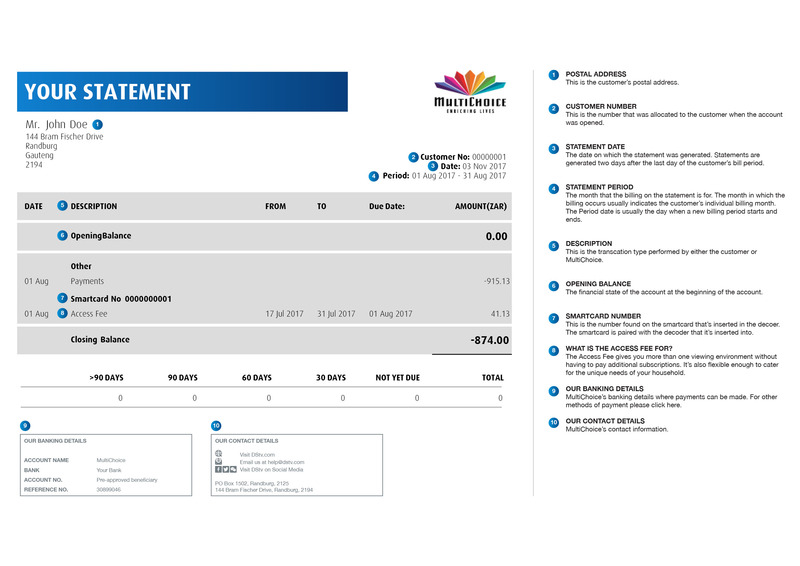 Please familiarise yourself with the data costs charged by your Internet Service Provider (ISP), as DStv cannot be held responsible for high data bills received from your ISP. Is the video in DStv Now available in HD (High Definition)? A selected number of Live TV channels are available in HD (High Definition). DStv Catch Up videos are currently only available in SD (Standard Definition). Which Countries have access to DStv Now? DStv Now is available in the same African countries as DStv's satellite services. Is the content the same for every country? Content may differ from country to country based on the content licence available for broadcast per region. When I am travelling overseas, will I be able to watch DStv Now content? No, DStv Now content is only available in DStv territories across Africa. How many devices can I register to my DStv account? You can register a maximum of four devices to your single DStv Premium, DStv Compact Plus or DStv Compact subscription. A maximum of two simultaneous viewing streams across your registered devices is permitted. This means that you can either: be streaming two live TV channels OR stream two Catch Up videos OR stream one live TV channel and one Catch Up video. Can I use Airplay to stream DStv Now content from an iOS device to a TV? Airplay is available when using an iOS device with the latest version of the DStv Now iOS app. For Airplay to work, the source and target devices both need to be on the same Wi-Fi network. The Airplay icon will become visible once the video has started playing. Can I use Chromecast to stream DStv Now content from my app to a TV? Chromecast is available from both the Android and iOS DStv Now apps. For casting to work, both devices need to be on the same Wi-Fi network, you need to have a compatible cast device (i.e. Chromecast or Android TV) and your Wi-Fi network needs to allow casting by unblocking the cast ports. If you are having trouble using Chromecast, please visit Google Chromecast Help at https://support.google.com/chromecast. Where else you can find DStv Catch Up? DStv Catch Up is also available on the DStv Explora, HD and SD PVRs. DStv Premium customers can also connect their Exploras to the internet for DStv Catch Up Plus where they will discover more movies, series, kids’ shows and sport available to download and watch when it suits them. For more information on how to connect your Explora to the Internet, visit https://www.dstv.com/getconnected. What happened to the DStv Desktop Player? As technology evolves, the most prominent web browsers made the decision to stop supporting Flash video plugins. In line with this global trend, we've made some changes to our DStv Now online service. Our DStv desktop player is a flash-based service, The download option is no longer available online as our DStv desktop player (which was a flash-based service) was discontinued in October last year. You can still stream your favourite shows or movies online, or use the DStv Now app to manage your downloads. What kind of player do you use for DStv Now online? We use an HTML5 player which gives our customers a more secure environment and better playback experience when streaming Live TV or Catch Up. If you would like to download content, please use the DStv Now app. What is a Connect ID? A Connect ID is a profile that allows users to login to all DStv websites and Apps. These include SuperSport (website and App), dstv.com (website), DStv Now (website and App), BoxOffice (website). A Connect ID is required in order to access certain website and App functionality, as well as all services linked to DStv. How do I register; where do I go to register for an account? Follow the "register" prompts on the DStv Now website in order to complete your registration. I forgot my password, is there a way that I can retrieve it? DStv Connect has a "forgot password" link where you request to reset and change your password. I am asked to link my smartcard; what does this mean and what is a smartcard? A smartcard is a unique chipped card that exists in your DStv decoder. This card is linked to your decoder and your customer number that was created with MultiChoice when you initiated your DStv subscription. Your smartcard number is on the reverse of your smartcard, underneath the barcode. By linking your smartcard to your Connect ID, we can identify what subscription you are currently enjoying with DStv and deliver the relevant services to you. Please follow the "link smartcard" prompts on the DStv Now website to complete this action. How do I change my profile name and personal information? DStv Connect gives you an option to change your profile picture, name and personal details on the "Update Profile" page on the DStv.com website. What are DStv live TV channels? These are the live DStv channels currently broadcast to DStv decoders. DStv Now allows you to view selected channels on your PC or MAC , tablet and mobile phone using an Internet connection. Which channels are available for streaming? The channels available for streaming on DStv Now depend on the package you have subscribed to (DStv Premium, Compact Plus, Compact, Access, Family or Easy View), as well as the country you’re subscribing from. In addition, not all the channels available on your package have streaming rights, therefore they may not be available on DStv Now. Certain programmes are not playing but display a black screen with a message; what does this mean? Due to studio rights certain shows are not licensed for DStv Now. We are working to clear more rights in the future. Can I record my favourite shows with DStv Now? Unfortunately, Live TV does not offer a record feature within DStv Now. However, Catch Up offers a great selection of the most popular series and movies for you to stream on smart phones, tablets and the DStv Now App. You can set a recording directly from the TV Guide with the Remote Recording functionality if you have a DStv Explora at home and it's connected to the Internet. Can I pause, fast forward and rewind like I do on my decoder? Unfortunately these features are not available using DStv Now's live TV streaming; however they can be used while watching DStv Catch Up. Is the schedule on my TV the same as the schedule on DStv Now? DStv Now follows the schedule of programmes currently being broadcast on DStv. However, some shows may not be viewable due to studio licensing restrictions. I share my PC, laptop, and tablet with my children; can I set parental controls on DStv Now to restrict my children's viewing? This feature is currently not available on DStv Now. However, age restrictions are clearly marked. We urge you to closely monitor the content that your children may be watching using DStv Now. Why can't I stream Live TV when I am overseas? MultiChoice only has the rights to make content available on DStv Now within the borders of the African continent and adjacent islands, which is why streaming on DStv Now is not available outside of these borders. What is DStv Catch Up? DStv Catch Up is a video-on-demand service, available to DStv Premium, DStv Compact Plus and DStv Compact customers. DStv Premium customers can access DStv Catch Up via any of our PVRs (requires payment of a monthly Access Fee), the DStv Now website ( www.dstv.com/now) and on selected smartphones and mobile devices (via the DStv Now App). DStv Compact Plus and Compact customers can access DStv Catch Up via the DStv Explora (requires payment of a monthly Access Fee). DStv Catch Up gives customers the ability to "catch up" on a selection of great content available from across the various DStv channels, ranging from series to movies, kids' shows, documentaries, and selected sporting highlights on demand. Why can I download some Catch Up series and movies but only stream others? Depending on the usage rights granted to us by the studios and content producers, DStv Catch Up content can be made available by means of streaming online and via the App, or through downloads on to smart phones and tablets, via the App. How long is content available on DStv Catch Up? Content is typically available between 7 and 28 days from date of first broadcast. This availability varies, depending on the usage rights granted to us by the studios and content providers. Can I copy DStv Catch Up shows to a portable hard drive? Due to strict copyright requirements, we currently cannot offer the ability to copy shows to any of external devices. When will my show be on Catch Up? How do I know if my show will be on Catch Up? To see if your favourite show or movie will be on Catch Up, please check our Catch Up Series Calendar * on the DStv website. Watch out for the on screen icons at the beginning of the Live TV shows. Why is the online version of a show sometimes available before it is on my Explora? The extended catalogue available when you connect your Explora to the internet, is updated via the internet, whereas the Catch Up that is delivered to your Explora goes via a satellite. This means that content might arrive sooner on the online catalogue than the Catch Up service on your decoder. Why can't I stream Catch Up when I am overseas? MultiChoice only has the rights to make content available on DStv Now within the borders of the African continent and adjacent islands, which is why streaming on DStv Now is not available outside of these borders. If you download a Catch Up title on the app prior to leaving, you will be able to watch that on your device while travelling. Why can't I download my shows from the website anymore? How can I download my shows to watch them offline? You can download using our DStv Now app. Our DStv Now app offers you a range of different services - you can stream over 60 live channels including sport, download your favourite Catch Up show to watch later and even manage some aspects of your account on My DStv. When you are on the go with your kids, we'll help you to keep them entertained with our special DStv Kids' section. Which browsers can I use to stream series and movies? Keep your browser and operating system up to date with the latest security updates to enjoy the streaming service at its best. Is the TV Guide on DStv Now the same TV Guide as the one on my decoder at home? Yes, the TV Guide on DStv Now is the same as the TV Guide on your decoder, with a few added features. Some channels on the TV Guide are marked with this icon: What does this mean? All the Live Streaming channels are marked with this icon; it simply means you can watch Live TV on these selected channels. How many days worth of programming does the TV Guide display? A total of eight days worth of programming, including the current day. How do I set a reminder on DStv Now? Simply select the reminder icon within the TV Guide and choose whether you want to be reminded in 5 minutes, 15 minutes, 1 hour or 2 hours before the show starts. There are programmes on the TV Guide that are marked with an What does this mean? By tapping the "i" you will get the full programme description. Some Guide programmes have this symbol: What does this mean? The programmes that are marked with this icon cannot be streamed on DStv Now due to studio rights. Remote recording is a feature on the TV Guide that enables customers with an internet connected Explora to set recordings from their PC or mobile device to their Explora at home. Customers must have an active subscription and be paying the Access Fee to use this feature. What do I need so that I can start remote recording on my decoder? A DStv Connect account with your linked Explora smartcard. Do I change my decoder settings to enable remote recording? When you have met the above criteria, you will see this button upon clicking on a programme. Clicking on it will trigger the recording. Can I record a programme that is already airing? Yes, the recording will start at the point you set the remote recording. You will not get a full episode recording. Can I delete my recorded programs using DStv Now? Unfortunately the delete functionality is not yet available on DStv Now; this will be available in the future. Can I set a series recording via remote recording? Series recordings can only be set on the decoder. When setting a remote recording (online at dstv.com or via DStv Now), you are only able to schedule a once-off recording for the selected programme. Remember, all remote recordings take priority and conflicting recordings will be cancelled (and automatically rescheduled where possible). Will I be notified if my recording was successful or not? No, we are only able to confirm if the recording was successfully scheduled. Can I record two programmes that are in the same time slot? No, only one programme can be recorded per time slot. If you attempt to record another programme your decoder will automatically override the first recording in favour of the second one. This message will be displayed: "Your decoder resolved a conflict and scheduled your recording successfully". Note: Your decoder will look for another airing of your original recording and if it exists will set a recording for it. "A recording for this programme has already been scheduled"
"An error occurred, please try again"
Live chat: on the DStv Now website during operating hours.